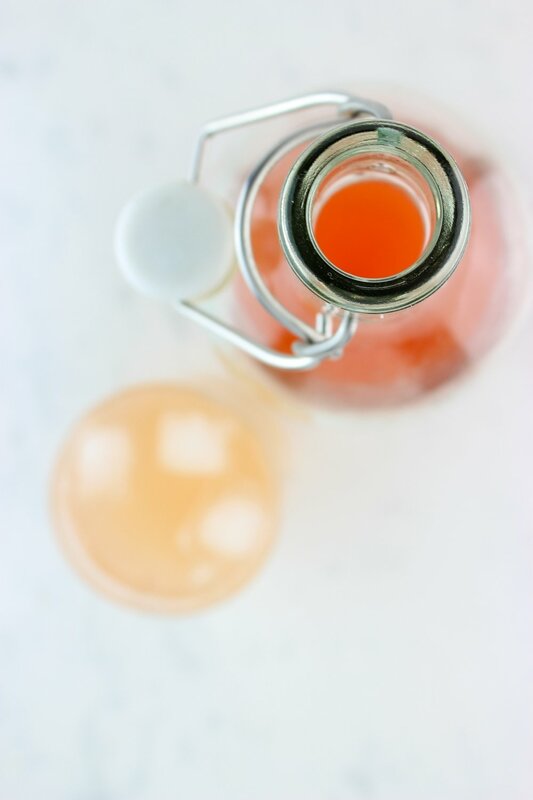 There are endless ways to make drinking vinegar dependent on how much time you have and your preferred way of infusing fruit. We've made three different flavours, three different ways so we'll talk you through all of these, as well as a final way if you have a little more time on your hands. 1. Take your fruit of choice and slice, peel and mush it up until it's broken down a little - the riper the fruit, the better. 4. Store in the fridge for up to 6 months. Notes: the amount of each ingredient is just a rough guide - we recommend sticking to these quantities the first time, then adjusting dependent on your preferences - more/less/alternative sugar, more/less vinegar etc. 1. Add the sugar and water to a pan over a medium heat. Stir continuously until they're fully combined then turn the heat down to low to let the excess water boil off. After about 5 minutes, add the fruit and continue to heat over a low heat for a further 10 minutes, or until the liquid has taken on the colour of the fruit and the fruit has been stewed. 2. Wait for the mixture to cool then strain the liquid from the fruit (keep the fruit for porridge purposes!). Add it to the glass container then add in the apple cider vinegar and shake slightly to combine. 3. Store in the fridge for up to 6 months. Notes: we find it harder to decrease the sugar content when using this method as it won't create the 'syrup' consistency. It's also harder to switch out sugar for honey or maple as it doesn't combine the same way. If you want your shrub ASAP, then it's a great, quick method though! Not necessarily a separate method, but the method above can also be broken down into steps. We always keep a jar of infused sugar syrup in the fridge for cocktail related purposes (highly recommend) so once we have this, it's also super quick to turn it into a shrub by just mixing a little with vinegar. This is how we made our pomegranate shrub! Notes: This one is probably the easiest for getting a super low sugar content from as you don't have to worry about anything boiling down or not producing liquid. We've gone as low as 1/4 cup honey on this one before and it was very strong on the ACV front but we're sort of into that! We could probably go on endlessly here (nothing gets us going as much as flavour combos...), but we'll instead keep it to the basics. Our go-to is always apple cider vinegar because it comes with so many health benefits (just make sure you use unpasteurised ACV with the mother! ), but it's also fun to add other elements such as balsamic vinegar or even champagne vinegar. Public enemy no.1, but also an essential element of drinking vinegars unless you just really love the taste of vinegar - it helps to bring out the fruity flavours and reduce the tartness. We once tried going sugar free just to see what happened and the only way to make it enjoyable was to mix it with tonic water or a similar sugary drink, so we'd rather just control the sugar that we put into it ourselves, and leave the mixer as something sugar free. For both the rhubarb and citrus flavours pictured, we used raw honey as our sugar and they were definitely our faves yet. They added enough sweetness, and also lended a lovely honey taste. If you're vegan, maple syrup works equally well. The pomegranate option was make with organic white sugar, but we actually much prefer the honey versions, so don't be afraid to 'replace' the sugar with your preference. For day to day drinking, sparkling water or soda water (we're yet to understand the difference between the two..) is our go-to, on a ratio of about 5:1 water:shrub. Come the weekend though, we're all about shrub-based cocktails. As you've already done all the hard work, making something quite 'fancy' is really easy now. It's the perfect addition to a G&T or bellini-style with prosecco, but it works equally well with a mixer (tonic or soda water generally) and pretty much any spirit from vodka to whiskey dependent on the flavours you've used. For example, summer lends itself favourably towards a strawberry and basil shrub paired with soda water and vodka, whereas in winter we'd veer towards an apple and cinnamon shrub paired with ginger ale and whiskey. Fresh + Preservative Free: But How?